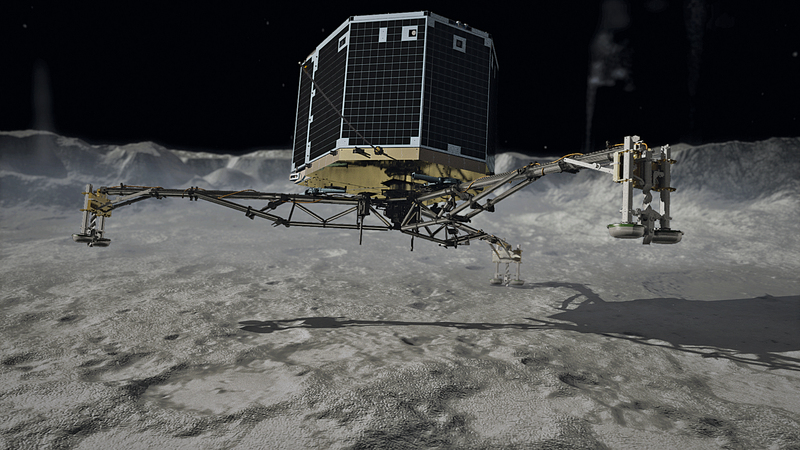 A major triumph for humanity : Philae to explore the universe ! The 12th of November was a big day for the scientific world : the lander has succesfully touched down the comet « Tchoury ». Indeed, the European Space Agency (ESA) had warned that such a manmade object’s landing was not guaranteed. Philae is a Rosetta‘s robotic space probe lander which aims is to collect information about the comet « Tchoury » in order to make a detailed study of the star. All comet studies should help humans to understand the creation of the universe and of our Solar System. The Rosetta project was developed by the ESA and the spacecraft was launched March, 2, 2004 on an Ariane 5 rocket, from Guiana Space Center in French Guiana. As a matter of fact, the intensity of gravity is less important at the equator than at the poles. Consequently, it is more economical in fossil energy. Moreover, engineers use the gravity of stars and planets to help spacecrafts reach their goal with a minimum energy consumption. Rosetta arrived on « Tchoury » last august and launched Philae after a few months of observation. Its landing on the comet was filmed and broadcast « live » on the 12th. It did not happen as expected by ESA scientists. Would you believe that Philae bounced twice and during 2 hours, before it really landed ? In fact, the harpoons, initially expected to anchor the engine to the « soil », did not work suitably . It provoqued dust clouds that revealed the existence of complex organic molecules on the comet. This discovery may imply that stars are composed of amino-acid or even complicate molecules that could have been transported (we do not know how) to the Earth and are suspected to be a factor of development of life on our planet. The person in charge of the German-built COSAC instrument which detected these molecules, Fred Goesmann, said that one of them has been identified, without saying more. Moreover, Philae is equipped with a thermometer-hammer, MUPUS, which measured a – 150 Celsius degree temperature and a soil « hard as solid ice » (ESA). But according to scientists, the entire comet can not be that dense because of its porosity. French Toulouse « Etudes Spaciales » team leader, Philippe Gaudon, revealed to the press that, Philae is slanted at a 30% angle, stuck near a cliff. After 57 hours of data collecting, Philae went into sleep mode because it had no more energy. But it is equiped with batteries that can recharge thanks to solar pannels. Unfornately, Philae’s location did not allow it to receive a lot of solar energy (only 1 hour per day). But the engineers succeeded in redirecting its solar pannels in order to improve the duration of exposition. Anyway, it had enough time to send a large amount of data that humans will analize during the months to come. Nevertheless, the goals have been broadly fullfilled. Indeed, even if all Philae’s instruments may not have worked according to plan, ESA scientists did not expected to go that far in the mission. The data collected will probably give some answers to a lot of questions about our universe. This progress can be compared to 1969 Apollo 11 & Neil Amstrong’s first foot on the moon.